Like any of the checklist items in your wedding day, there are a growing number of "need-to-knows" about almost every service vendor you might hire. Our specialty, hair, and makeup, ranks top of the list when it comes to doing your diligence. But photography and videography is also an area where you want to really know what you're looking for and how far in advance you need to begin thinking about it in order to secure the people that are not fly-by-night freelancers - but here for your lasting memories and the long haul. 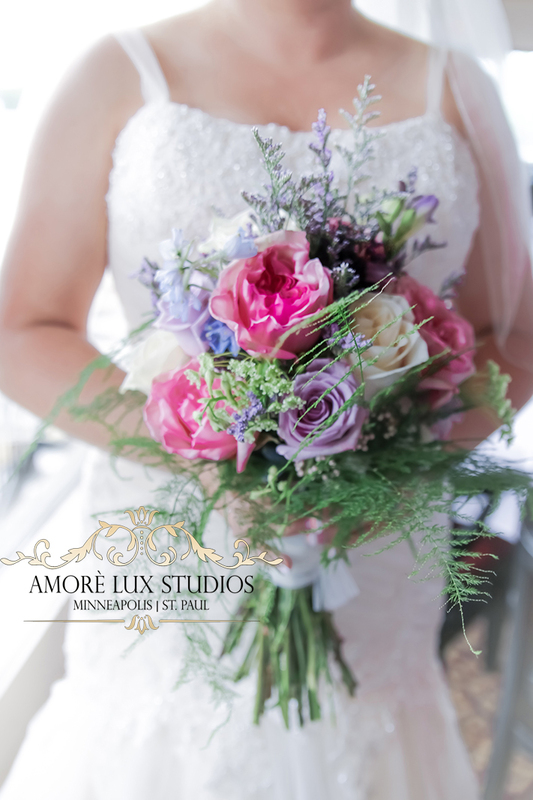 So we interviewed the Executive Director of Amore Lux Studios, Kelly Barry-Miller - one of the top teams in the Twin Cities when it comes to photo and video all under one roof. How far in advance should you book your photographer and/or cinematographer? As seasoned professional and award-winning photographers in the Twin Cities, we receive bookings six months to one year in advance. So it is imperative to book with us as soon as you get engaged or you have set a date for your big day. For wedding cinematography, expect to book three to six months in advance. At Amore Lux Studios we have three truly talented cinematographers, so we have more options for our Brides and Grooms when it comes to booking their wedding dates. When planning your wedding, you should know in January of 2017, we are already receiving wedding contracts for 2018. The industry, in general, has expanded its vendor commitment times. When looking at pricing; what can a couple expect to spend on photography when they want to book their engagement session and their wedding day with the same photographer? You will find that the pricing structure for each photographer will be different based on the experience and education they have, as well as the quality of their work, their portfolio, camera gear, knowledge, experience, and training. Our Associate Photographers start at $1800.00 (for full wedding day) and a Master Level photographer starts at $2400, based on package collection choices. We love to add a few complimentary items as an incentive for our wedding couples to book with us, such as custom print credits and engagement sessions, because it is a great way for us to get to know our clients in a personal photography setting, before their big day. We are also one of the only photography companies in town that offer full design and wedding day branding services, which promote a luxurious and cohesive visual feel to the day. We can customize any collection to match the vision and budget of our clients. What are some key elements to consider when looking at a photographer's portfolio? The quality of imagery is number one when looking at a photographer’s portfolio. Every photographer has their own style, personality, and creativity that they bring to each session, so it is a matter of finding the right photographer that fits your personalities and the vision or style you are looking for. Seasoned photographers will have consistent imagery within portfolios which showcase their unique style and full weddings within their galleries. I would highly suggest asking your photographer to see a few of their full-coverage weddings because you will see how they are able to handle different lighting situations that can happen throughout the day. What advice can you give to couples about deciding whether or not to do a "First Look"? Does this typically affect pricing? Deciding whether or not to have a “First Look,” shouldn’t affect pricing at all, however, it can affect the overall stress level of the day in regards to your wedding day timeline. We always honor our couples who want to see each other, for the first time, “walking down the aisle,” if that is what they have always dreamed of. However, having that unique and very special quality time of seeing one another “before” the ceremony for a first look, can be just as special and will produce an easier schedule for you – the Bride and Groom -- to be able to have the formal/family and bridal party pictures done before the ceremony. It usually provides more time for fun the rest of the day. We have found that our wedding couples are far less stressed and can truly enjoy one another and their guests, during their wedding day, when a first look is added. What are some of the benefits of having a cinematographer in addition to the photographer on the wedding day? Since we offer both photography and cinematography for our couples, we can tell you firsthand that the couples who decided to save money and not book a cinematographer have come back to us wishing they would have booked. Because even though pictures capture the day as it is unfolding, it doesn’t capture the energy, atmosphere, and living personalities of each person. A special moment captured with photography is beautiful, but being able to see the same moment in full action, HD film is another thing altogether. It brings that extra dimension that pictures simply can’t bring by themselves. We recently had an after-wedding viewing party with one of our bridal couples to show them their pictures and video. They loved the pictures and had smiles on their faces afterward, but when they viewed the video they were whole-belly laughing at the fun moments, crying good tears at the sentimental ones, and were completely brought into their wedding day all over again. It is difficult for brides and grooms to remember their wedding day because everything goes so fast that it is like a fog in their memory, but being able to view it in real-time, HD, they are able to truly enjoy all the little things they couldn’t remember, that happened. A quick story . . . one of our brides asked us if we had any extra film footage of her Grandfather because he recently passed away. We were able to find it and send it to her, and she was overwhelmed with joy at being able to see him moving in real life - essentially capturing his essence and personality in action. That is the power of video. And that is the reason every bride should add cinematography to their wedding day. Should the bride and wedding party hire professional makeup artists and hair stylists? ABSOLUTELY, beyond a doubt. Every bride should at least consider, if not hire Makeup and Hair Artists for their big day. Professional photography goes hand-in-hand with makeup and hair artistry. If a Bride and her attendants want to look and feel their best in front of the camera and have stunning images for this milestone event, they must be willing to add hair and makeup artists into their day. In your experience, what are some regrets that couples have about their photography or videography after their wedding? These are things that new brides can learn from the ones who have gone before them, and be proactive with when they are considering who to hire for their wedding day. It is easy to look at the budget because let’s be real... not everyone has a ton of money to spend on their weddings, but they still want a fantastic day. The main money-saving area that brides will go to, is to book a lower priced photographer and no makeup/hair artist. They don’t realize at the time that the only lasting thing after the wedding celebration is the images and film footage from the day. It is VITAL to have professionals who know what they are doing and are highly educated and seasoned in their artistry, in order to have memories they will cherish through the generations. It’s unfortunate but wedding couples will spend a fortune on their venue, caterers, flowers, etc. and then skimp on photography/cinematography and hair/makeup artistry. Once brides’ understand the value of investing in great photography, cinematography, and makeup/hair professionals, then they understand after the wedding day, why their investment ended up producing such gorgeous memories for them, and there are no regrets. It is the couples who are only looking at cost, and not understanding the value and investment that end up with the regrets. What are some of the perks of choosing Amore Lux Studios over other photography/cinematography companies in town? Thanks for asking! First of all, we work hard to ensure that our client services are truly the best in town. We give our complete heart and souls to each client, making sure their every need is taken care of with integrity, from the time of initial consultation all the way to final delivery of images/film and beyond. We don’t see our clients as one-time bookings, but lifelong friends that we are honored to take care of. We also view each client as an individual, with individual styles and taste, and that is why we offer varying degrees of customization so they feel confident they are getting services that are custom-designed just for them. Most wedding photographers are what we call “shoot and burn” professionals, which means they take pictures and then burn them to a USB or DVD, and give it to the client. They don’t provide additional quality printing and design services. However, Amore Lux Studios offers extra design/branding a-la-carte options to go with each collection, which gives the clients that luxury visual feel. We have custom invitations, save-the-date cards, guest sign-in albums, wedding ceremony cards, reception menus, wedding websites, thank you cards, fine-art Italian albums, and so much more. Our design services are rare to find in town, so clients love being able to get that perk of working with us, along with the gorgeous imagery and film footage. How would a client go about booking an Amore Lux photographer or cinematographer for their wedding day? We absolutely love to meet with our clients one-on-one for a complimentary consultation. This is the time that we can truly meet and get to know them better, as well as hearing the vision they have for their beautiful wedding day. Clients can simply complete our online Wedding Day Inquiry Form, to check on our availability, and to schedule a bridal consultation with us. The photographers/cinematographers are the only ones who are with the bride and groom all day long, so we want to make sure we are all comfy together and know one another. During the consultation, we can answer any questions and go over our packages and collections, and customize it to the client's needs. At the end of the consultation there is no pressure at all to book, but if a client is happy and wants to book with us, then we can walk them through the contract, and they can submit a 30% non-refundable retainer fee, at that time, to reserve their Amore Lux Studios professionals for their wedding day. Or if they want to go home and think about it, we have convenient and verified online contract-signing, and payment submissions. So there you have it. Planning your wedding can be hard enough - you don't need to worry about the minutia. Seasoned professionals may cost more in some cases, but they bring value and experience to the table. Hopefully, some of your concerns about hiring a wedding photographer have been addressed here. You can always reach right out to the Amore Lux Studios staff for more intimate conversations. Don't forget about your hair and makeup! You can have your cake and eat it to with Amore Lux Studios!! tagged with Top Things to Know Before Hiring a Wedding Photographer, wedding photographers in minneapolis, wedding photography, should I hire a videographer for my wedding?, should I hire a makeup artist for my wedding?, How do I find a good photographer for my wedding?